2 weeks ago I posted our Mac & Cheese where I shared that I added pan fried cod fish and bacon bits. 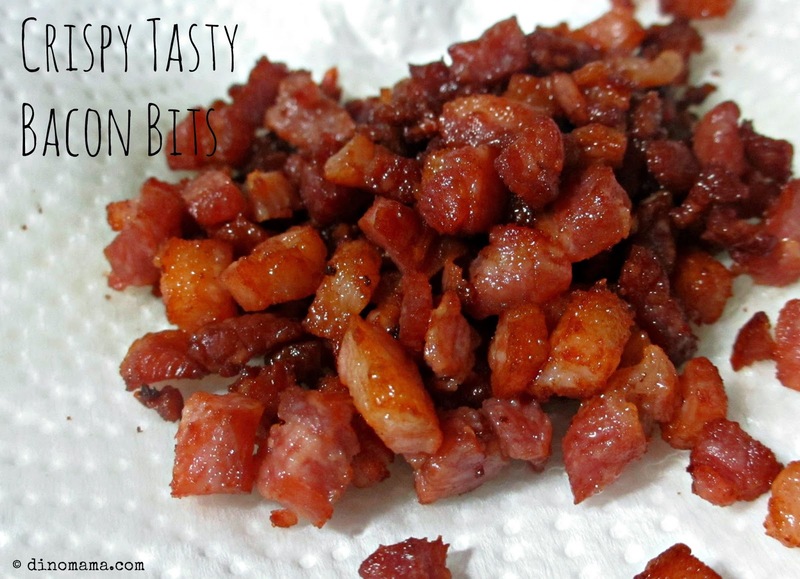 Today I am sharing with you how I made my crispy bacon bits. 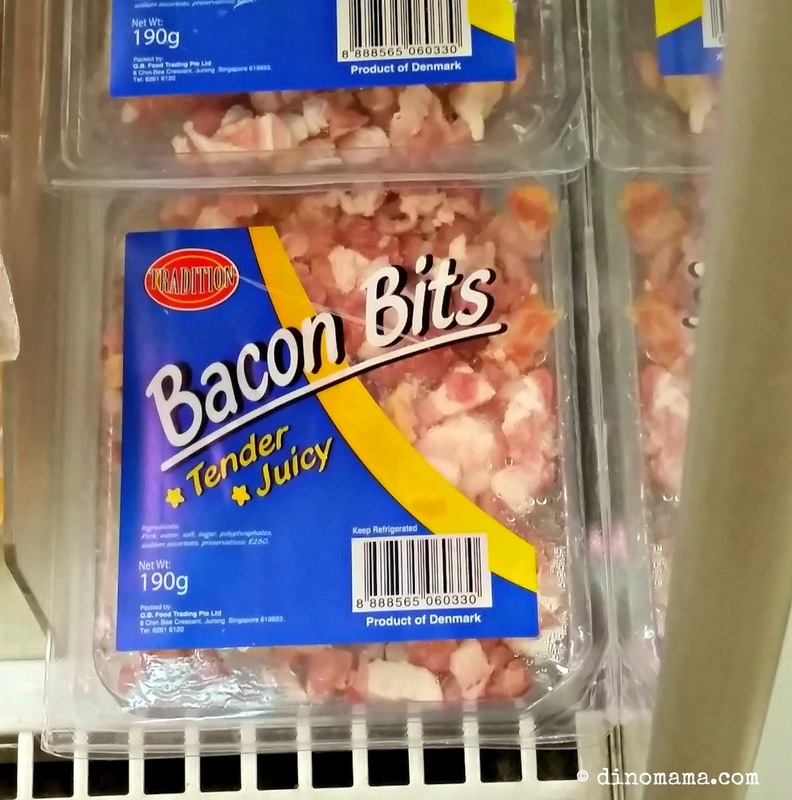 While walking around the supermarket trying to think of ingredients to add to our mac & cheese, I chanced upon this fresh bacon bits. I don't really like bacon bits on my food when dining out because I find that they are too hard and salty. This is the first time I am seeing this fresh bacon bits as I rarely wonder into the cheese section in that particular supermarket, Without thinking much I dropped a packet into my shopping basket. Well, what I do not like usually does not mean that the rest of the family are deprived of them right? "Tender & Juicy" it says on the packet and Tender & Juicy these bacon bits are after frying them. It is very easy to prepare bacon bits. First, heat up your frying pan and add cooking oil. 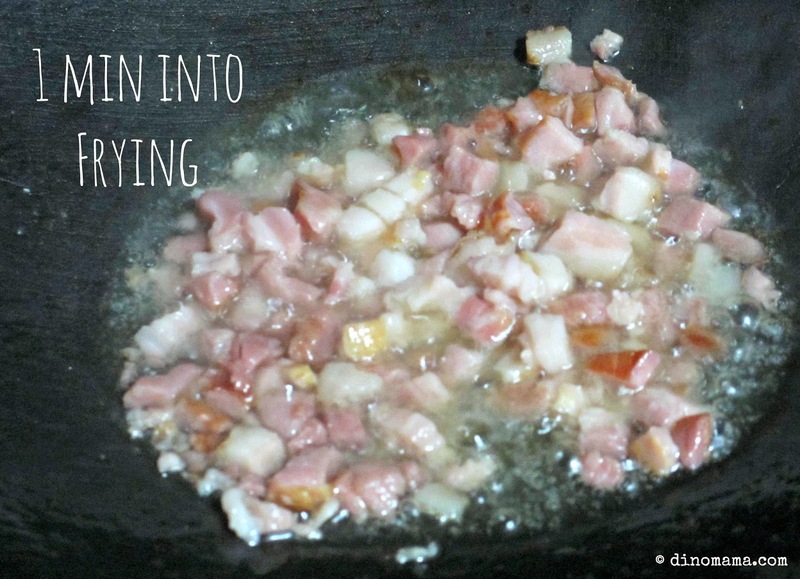 Once the oil is hot enough, add in the fresh bacon bit to fry. Stir them frequently to prevent the bacon from getting burnt. Word of caution - the oil will splatter so be prepared for it. 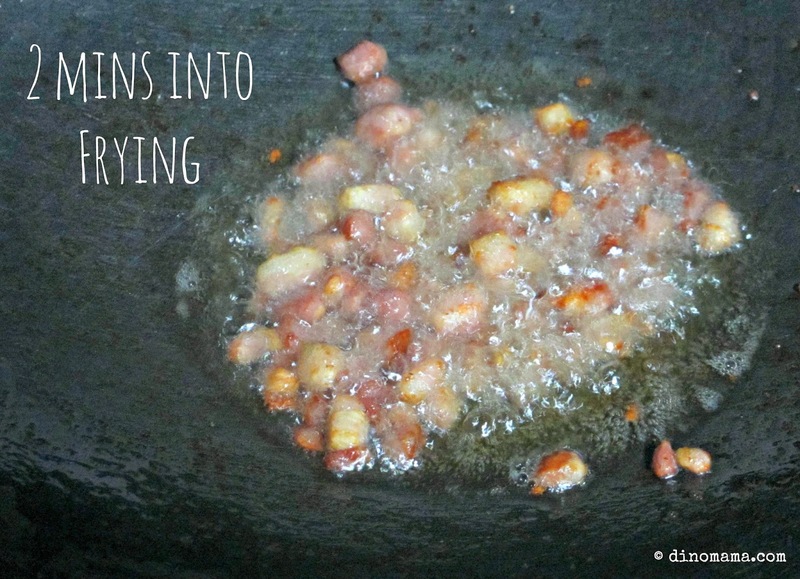 Continue to fry the bacon bits till they obtained that golden brown color. There are going to be a lot of bubbles but that's caused by the grease from the bacon bits, nothing to be alarm of. I am using my traditional cast iron wok so the temperature is higher than frying pan, my bacon bits were ready after 5mins, you may have to fry them longer in your frying pan. Dish the fried bacon bits out on some kitchen towel to get rid of some extra grease. Here's my tasty and crispy bacon bits, cooked to my liking, not too hard or salty. I only cooked the amount I required that day, the rest of the fresh bacon bits are sitting in my freezer. I read on the net that you could fry the whole lot and freeze the fried bacon bits in ziplock bag. Of course, its's ok if you do not want to buy a packet of bacon bits, just buy some fresh bacon, dice them up (not too small pieces) and fry them. Besides adding these crispy bacon bits to your pasta, you can add them to your salad, baked potato, omelette etc. 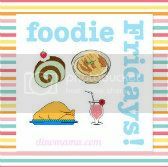 Which ever way you choose, remember to have fun making these and enjoying them after that!